No sooner had he produced a new quality lens hood for the fabled 50/1.1 Nikkor, did Tom Abrahamsson of |Rapidwinder fame start planning new hoods for the 35mm f/1.8 and 35mm f/2.5 Nikkors. 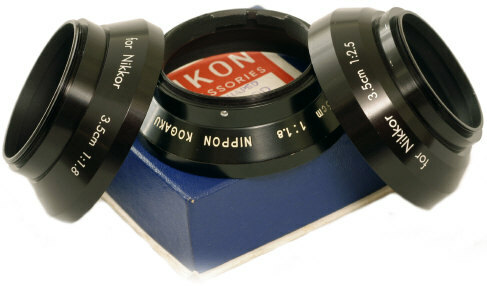 Original Nikkor lens hoods are extremely difficult to find, and their exorbitant prices prevent sane photogs from shooting with them in the field and risking loss. Can you spot the original Nikkor hood? The classic 35mm f/1.8 Nikkor hood clip on hood is in the center, the two new Abrahamsson hoods are on either side. Tom's hood are screw on, which prevents them from easily being knocked off like the originals. The new 35mm f/1.8 hood has a 48mm thread, the 35mm f/2.5 has a 43mm thread. These new hoods are actually better made than the originals, machined out of a block SINGLE piece of aerospace aluminum alloy which is then machined on a precision CNC milling machine. Tom used original Nikkor 35mm hoods as templates for his reproductions, as the pic on the left shows. 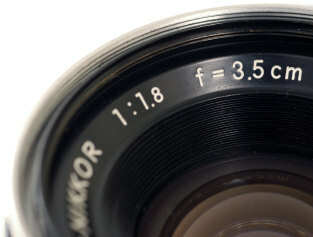 While all classic 35 Nikkors in rangefinder mounts (35/1.8, 35mm f/2.5, 35/3.5 in Nikon or Leica Screw Mount) had 43mm filter threads, the Nikon version of the 35mm f/1.8 also had 48mm filter threads on the INSIDE of the aperture ring. 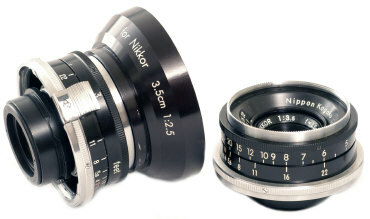 Thus Tom's 43mm 35mm f/2.5 shade can be used on most rangefinder 35mm f/1.8, 35mm f/2.5, or 35/3.5 versions of these classic Nikkors, in either lens mount. Likewise they can be used with just about any classic 35 or 50 lens with 43mm or 48mm filter threads, including the new Cosina Voigtlander SC 35mm f/2.5. 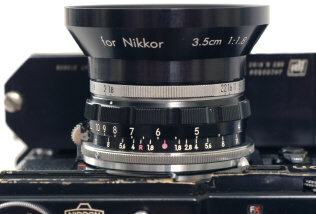 The later black 35 Nikkors in Nikon rangefinder mount shown here are also usable on classic Zeiss Contax rangefinders (not modern G series) or their Russian Kiev copies. The black lenses are considered more desirable today to collectors than their earlier standard chrome counterparts due to aesthetics and lighter weight. Unlike the original clip on hoods which could be knocked off easily, these are screw in 43mm and 40.5 mm hoods. Abrahamsson 43mm 35mm f/2.5 hood mounted on 35mm f/1.8 Leica mount Nikkor. Note the Leica screw mount 35mm f/1.8 has a 43 filter thread instead of both 43 and 48 for its Nikon rangefinder cousin. The lens is mounted on a rare Nicca made Tower Type 5 Leica copy, with its peculiar side hinged back. By the way, in my opinion the metal Voigtlander 28 and 35 brightline finders are easily the best brightlines of these focal lengths ever made by any camera manufacturer. 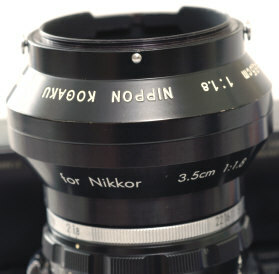 Do you need Tom's lens hoods for your Nikkor 35? Consider the alternatives. The original Nikkor hoods are extremely difficult to find, and expensive. Woe to you if you lose your pricey original Nikkor hood on that weekend shoot. With their screw in threads, Tom's hoods are more difficult to lose, but at least if you do, you can easily replace them. 2005 saw the surprise introduction of the Black Nikon SP 2005 with 35mm f/1.8 black rim Nikkor. This lens is ideal for Tom's shade -- to prevent the original's loss! Revised: September 12, 2017. Copyright © 2005-8 Stephen Gandy. All rights reserved. This means you may NOT copy and re-use the text or the pictures in ANY other internet or printed publication of ANY kind. Information in this document is subject to change without notice. Other products and companies referred to herein are trademarks or registered trademarks of their respective companies or mark holders.